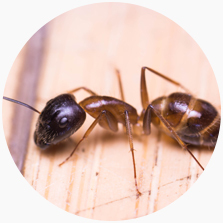 Being a fairly big genus of ants, Carpenter ants are known for their knack of causing damage to the wooden structure of your home (hence they’re commonly referred to as “wood eating ants). While they can’t cause the type of damage termites can if left undisturbed Camponotus sp infestation can lead to pretty expensive damage repairs. The interesting thing about the appearance of the carpenter ant is that this species can vary from black to dark orange. They measure around 3mm to 12mm in size and have a smooth body. Wood eating ants also vary in size depending on what function they play in the colony. Carpenter ants mate during late spring. It’s called a “mating flight” which after it finishes the males die and the females find a place to start their new colony. It can take up to six years before you notice any signs of infestation as that’s how long it can take for them to establish their colony. It takes six to twelve weeks for a carpenter ant to complete its lifecycle from an egg to an adult insect. Plot twist: Carpenter ants don’t really feed on wood, they just bore into it and then, dispose of the wood outside their nest. These ants prefer nesting in wooden structures, which makes your backyard gazebo or your wooden shed the perfect place for them to build their colony (let’s not forget any wooden structures of your home). Read more information about the carpenter ant here. As you’ll come to be aware, size isn’t everything in the ant kingdom. Fire ants are small, exotic insects that can inflict a painful sting to humans. Exactly this is what makes them so dangerous to have them around your property. 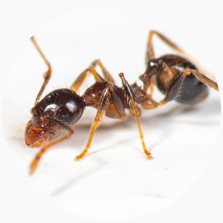 If you come to encounter fire ants on your property, it’s best to call professionals to handle them and to inform your local government, as they’re very dangerous. 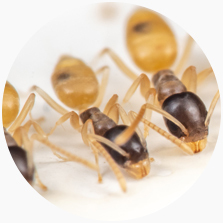 Solenopsis Invicta are around two to six millimetres in size. These little devils have copper-coloured heads and bodies, and slightly darker bottoms. The worker ants can be close to black in appearance! Like other species, fire ants begin their life as eggs, then, they turn into larva, followed by the pupal and adult ant stages. Fire ants prefer to nest in your backyard and would rarely enter inside your house. Pots on the ground or landscape decor (like logs and stone) are likely places where you can find them. Nests can be either dome-shaped mounds (30cm in height) or can be flat, resembling a patch of soil, which makes them hard to recognise. Red imported fire ants are extremely aggressive, especially if they’re close to their nest and are capable of inflicting painful stings. The green-headed ant (Rhytidoponera Metallica) is a species of ants that are native to Australia. The metallic pony ant has a painful sting and is also known to sting people. Though potent, the sting is fairly short-lived, so they aren’t as dangerous as other ants. 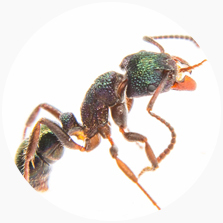 Like its name suggests, green-head ants have a greenish hue in their exoskeleton. Workers, females and males all measure around five to seven millimetres in size and have a well-armoured external skeleton. Fun fact! Male green-head ants can successfully mate with worker ants. This makes this species of Australian ants a gamergate species. The nuptial flights begin around September, or as soon as the temperatures drop below 25°C. You can find green-head ants around stones or rocks in your backyard. As these ants can help with the control of termites, if you have an ongoing termite infestation in your home, it may attract them. Finding flying ants in your home can be particularly scary. 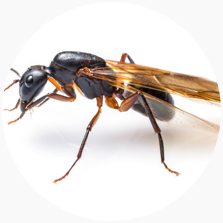 Not because they have a deadly sting, but more because they resemble termites, or equally worse, they may be carpenter ants. See, all species only fly when they breed, so winged individuals could mean you have an ongoing infestation. For more information see Carpenter Ants. Winged ants have two pairs of wings, with the bottom pair being significantly smaller than the top ones. They are also pretty short, shorter than their body. Flying ants have segmented bodies with easily identifiable parts, with a thin waist. Winged ants have the same lifecycle as other Australian ant species. Keep in mind that seeing swarms of flying ants in your backyard during the summer months is normal. That’s the mating season for ants, and swarms are just mating ants and not an ongoing infestation. Flying ants will rarely infest your home. All males die soon after mating and female queens are rarely a problem. However, keep an eye on your property for about a week or two after spotting swarms of flying ants. Bullet ants, bulldog ants, jumper ants – call them what you want, these little buggers are dangerous as hell! The Myrmecia Gulosa is a big species of ants that are notorious for their painful stings and aggressive behaviour towards humans. 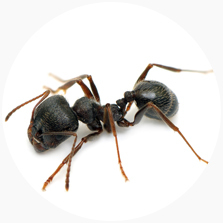 If you see a bull ant nest on your property, contact a professional pest controller to handle it. Get ready! Bull ants are known to grow up to 40mm in size. On top of their gigantic size, they also have strong and elongated mandibles. The ants are black in colour, however, some have red shading on their abdomen. Giant bull ants have three types of ants in their nest – female workers, fertile females and fertile males. All have their place in the nest as only females hunt. These bullies of the ant world are mainly found in mainland Australia. While they have notoriously aggressive behaviour, bulldog ants are extremely smart. In fact, they’re among the smartest ant species in the world! They are also known to communicate through touch and smell and to cause death in humans. Read more about bull ants here. 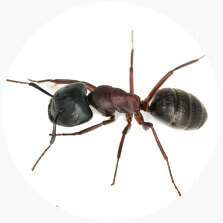 The everyday black house ant is one of Australia’s most commonly found pests. After all, just leaving dirty plates around your house is enough to attract them. If you start noticing black spots in and around your kitchen, you may have a black house ant infestation on your hands to deal with. With a size of just 2.5mm, Ochetellus Glaber has intensely black coloured bodies. The black house ant has a stocky body with two antennae on their heads. The black house ant has a normal ant lifecycle, undergoing full metamorphosis in 44 days. The pupa is creamy white and soft with a similar shape to the adult ant. The small black house ant builds its nest in cracks of foundation, near stone pathways. The insects also build their nests underground instead of above ground. Mostly considered a nuisance pest, black ants would enter homes in search of food. More information on how to get rid of black ants can be found here. Unlike other Australian ants, Argentine ants are known to displace native species. On top of that, they have multiple queens, which helps them breed rapidly and build huge colonies. The most noticeable sign of an Argentine ant infestation is the trail of worker ants that it can be seen when they’re looking for food. The Argentine ant ranges in colour, with some of the insects having lighter shades of brown and others being closer to black. They measure at around 2.5mm in length, which makes them a fairly average species of ants when it comes to size. The eggs of the Argentine ants are white and the insects take about 70 days to reach their adult stage. 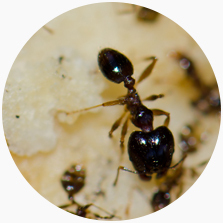 These ants are well known to construct their nests near old colonies, which results in the sharing of workers. Once could see their visible trails when the ants travel between the web of nests. 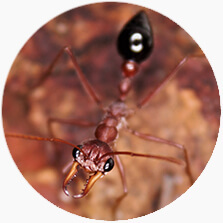 The Argentine ant prefers feeding on sweet or oily foods. Known for their incredibly invasive nature, the coastal brown ant is known for its quickly-built supercolonies. Considered mainly to be a nuisance pest, this species can cause a mass infestation. They are known to have a sting that’s not painful to humans. Also called big-headed ants, the coastal brown ant is fairly small, growing up to no more than 2.5mm in size. They’re gold-brownish in colour, hence, their name. Coastal brown ants hatch in about three to four weeks. However, the queen can lay close to 300 eggs per month and each queen can live up to several years. You do the math. The invasive brown ant is a species that creates supercolonies with multiple queens, which are known to reproduce rapidly. This means that if you find a sign of a coastal brown ant infestation in your property, you should act fast. Wait a couple of months and you may have a supercolony to deal with. 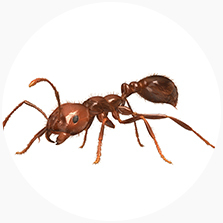 A nocturnal insect, you’ll most likely encounter the sugar ant in your home in the evening or at night. Worry not, as this species of ants is considered mainly a nuisance pest and despite their big size, sugar ants can’t harm humans. Banded sugar ants grow from 5mm to 15mm in size, so they’re pretty large. The females have black heads, while workers are smaller and slender. 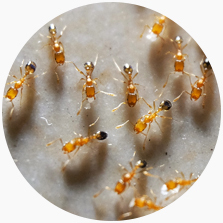 Depending on the humidity and the temperature, the sugar ant can vary in colour but they all have an orange-brown band. The banded sugar ant has a full four-stage lifecycle. There have been found nests with more than a single queen, however, most sugar ant nests will have only one queen ant. Scientists don’t know very much about the sugar ants’ nuptial flight. The interesting thing about sugar ants is that they use different social techniques – workers sometimes carry other workers, as well as pheromone trails and tandem running are also observed in the behaviour of this species. Banded sugar ants are mainly active during the warm seasons. These ants aren’t aggressive to people, so you’re pretty much safe. Believed to have plagued ancient Egypt, nowadays, Pharaoh ants are the most ubiquitous house ant in the world. This small species of ants can be found almost on any continent, which makes them a common pest Down Under, too. The tramp ants are minuscule in size, measuring at 2mm at the most. They’re reddish-brown in colour with a darker abdomen. Even though they’re small in size, Pharaoh ants have non-functional stingers which are used for the production of pheromones. Pharaoh ant queens are known to lay hundreds of eggs throughout their lifetime. Even worse, these ants are known to breed continuously throughout the year. The species prefers heated buildings and is also known to have multiple queens in a single colony. These ants use pheromones to communicate with each other. It’s interesting that their nests can be really small – often located between clothes or books. The pharaoh ants are known to prefer unsanitary sites to look for food. This makes them a very threatening pest for hospitals as tramp ants are known to enter surgical wounds. Small, translucent and emitting a specific rotten-coconut odour, ghost ants are commonly found in open packets of sugar and generally, in your kitchen pantry. This makes them a common nuisance pest in Australian households. Ghost ants stay true to their name – they are translucent and no bigger than 1.5mm. Still, these ants are recognisable by their black heads and small size. Because they’re so small and see-through, the ghost ant is quite hard to spot. Ghost ants are very adaptable. The queens would make sub-colonies where they lay their eggs. This makes the extermination of ghost ants kind of tricky, but not impossible. This species is known for laying a large number of eggs and female workers look after the eggs until they hatch. While the ghost ants don’t sting, they’re known for nesting inside homes and to transfer germs (which can lead to disease). They’re particularly attracted to sweets. They are known to bite, however, in most cases, no symptoms are observed. The garden ant is a native Australian species. Their colonies are known to grow up to 40,000 workers and some specimens apparently live up to 30 years. This species farms aphids for their honeydew. Strawberries are known to attract them and they will feed on any fruit that doesn’t have a thick protective skin. The garden ant is around 4mm in size and black in colour. Sometimes garden ants are confused for Argentine ants. Queens start searching for a suitable place to build their new nest immediately after mating. It takes around eight to ten weeks for the eggs to hatch. Queen ants are known to average around four-year long lives, however, some live for up to 30 years. 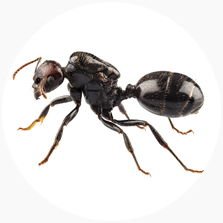 Garden ants are known to displace turf and are mainly considered a nuisance pest. Large colonies can cause more serious damage, especially if you have a fruit garden. Known to infest houses, the odorous house ant is a close relative to the ghost ant and the sugar ant. In addition, these ants are most likely to enter your home after a heavy rain. The stink ant can be found anywhere from North America to Australia, so let’s go into a bit more detail about this six-legged creature. The odorous house ant can vary from brown to black in colour and grow to about 3.2mm in size. Very little is known about the lifecycle of the odorous house ant. Queens are presumed to live up to eight months and workers – for a few months on average. Unlike queens, males tend to live for about a week. The nests of the odorous ants can vary in size – from a few hundred to thousands of worker ants. Foragers gather food from sources around the nest and then share it with the other ants in the colony. This could mean that if you see the odorous house ant in your home, there’s most likely a nest somewhere nearby.